There is a moment in time when your lead is in the perfect position to convert. They have just told you they want to hear from you, and they are actively checking their email inbox for a message from you. The message you send them in this moment has a higher likelihood of being read then any message you will ever send them again. Confirmation emails are probably the most wasted resource in all of email marketing. 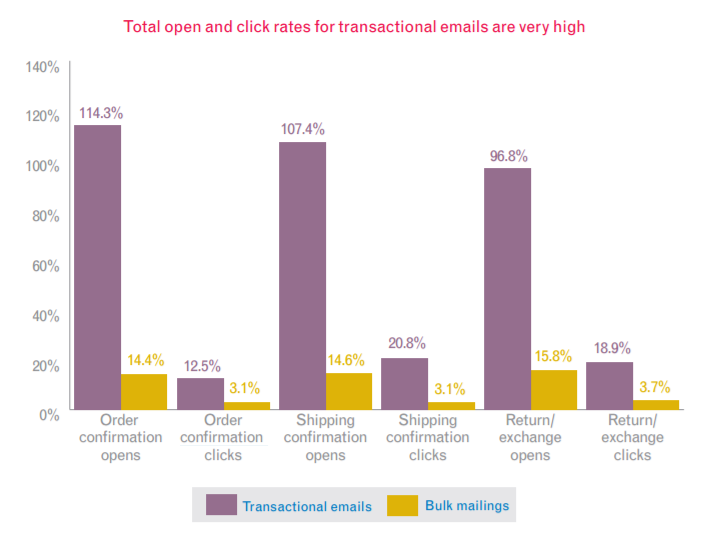 Like other transactional emails, they receive significantly higher engagement than typical bulk mailings from the same businesses. Unlike other transactional emails, however, confirmation emails provide you with ample flexibility to engage the user with your brand. You can invite the user to “confirm” and then engage with your brand in whatever capacity you deem best. Today, we’re going to help you stop wasting this unparalleled goldmine and start sending confirmation emails that drive conversions for your brand. What Is A Confirmation Email? Before we continue, let’s define what we mean by “confirmation email”. A confirmation email is an automated email triggered by a user action and intended to confirm to the user that their action has been successfully completed. Examples of triggering events include subscriptions, purchases, inquiries, etc. What makes confirmation emails such a powerful marketing tool is that the user typically expects to receive them and will often actively look for them. Like with any conversion optimization strategy, the first step to optimizing confirmation emails is to identify your objective. What do you want the user to do when they receive your confirmation email? Let’s take a closer look at each objective. This is the most straightforward objective and probably the best option “on average”. When someone signs up for anything triggering a confirmation email, they have taken a step forward in your conversion funnel and are likely in prime condition to be moved even further forward in that funnel. The only downside to this objective is that you have little time to build trust between past conversion and new pitch, which will affect how we use it throughout our funnel. If we use this earlier in our funnel, we need to make sure that we aren’t asking for much, since we haven’t had time to build trust in our brand. For example, if the user downloads a free lead magnet, you can pitch a low-cost “tripwire” product in your confirmation email. 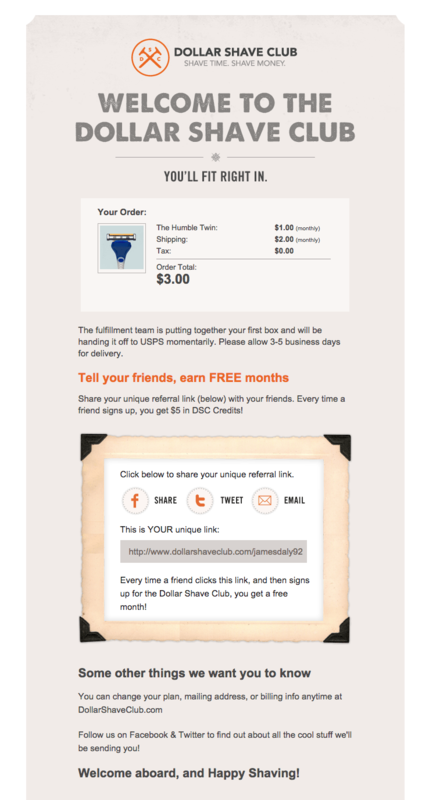 As soon as you’ve become a customer, The Dollar Shave Club attempts to move you further in the funnel by making you a referrer. This is a low investment ask on their part. It costs the customer nothing to make referrals and they will be rewarded for doing so, which makes it a great early-funnel strategy. This immediate conversion strategy can also be utilized later in the funnel, where you have already had time to build trust with the user. At this point, you can go for much larger purchases or much higher investment conversions. Offering something exclusive or time-sensitive can be especially effective here. For example, let’s take a SaaS company offering several pricing tiers. After converting a lead or past customer to their highest priced tier, they might include an exclusive offer for 1-to-1 consulting on implementing or optimizing their service. Alternatively, they could offer a turnkey solution to a problem the software is designed to help solve. Attempting to immediately trigger the next conversion won’t work for every business model. Sometimes, getting the lead to take that next step requires a good deal more nurturing than you can deliver in a single email. In this case, the goal is to utilize the lead’s momentary warmth to position them for long-term conversion. This could look like establishing authority or expertise, identifying additional information for advanced segmentation, setting clear expectations for future emails, or any number of things. When asked what they’d like to improve, 64% of email marketers said they’d improve personalization, yet split tests have shown that asking for more information from readers tends to result in a lower lead conversion rate. If you ask for that additional information in the confirmation email, however, you can improve personalization without sacrificing lead volume. This could be as straightforward as including a few extra data entry fields for users to fill out before hitting “confirm”. Or it could be a bit more subtle, like in this example from MailChimp. Notice the additional optoins under “activate your account”. If a user clicks on any of those options, it will log additional information about them in MailChimp’s database and likely trigger a different followup sequence. Targeting additional information in the confirmation email is a really easy way to get more information about your leads, setting you up for a higher conversion rate down the road. The final objective we’ll discuss is in some ways a subset of #2 in that it’s more of a long-term play. At the same time, the focus is a bit different and will really only apply to certain business models, which is why I’m making it’s own category. Engaging the subscriber with a personal connection is an objective unto itself. Many people are subscribed to hundreds of email lists, most of which they will never check or read and will probably unsubscribe when they do happen to see one of your emails. When get them to engage with you on a personal, 1-to-1 level, however, you become more than just another random brand spamming them with emails they’ll never read. You become a person they are interested in connecting with and following. Just like the rules of interpersonal connection dictate, he isn’t focused on himself and asking you to be interested. He is asking about YOU – the subscriber. What are YOU struggling with? He also does some of the things we talked about in the last section. And while this doesn’t work with faceless brands, it does work with personalities, especially when the personality is actually willing to engage with you. 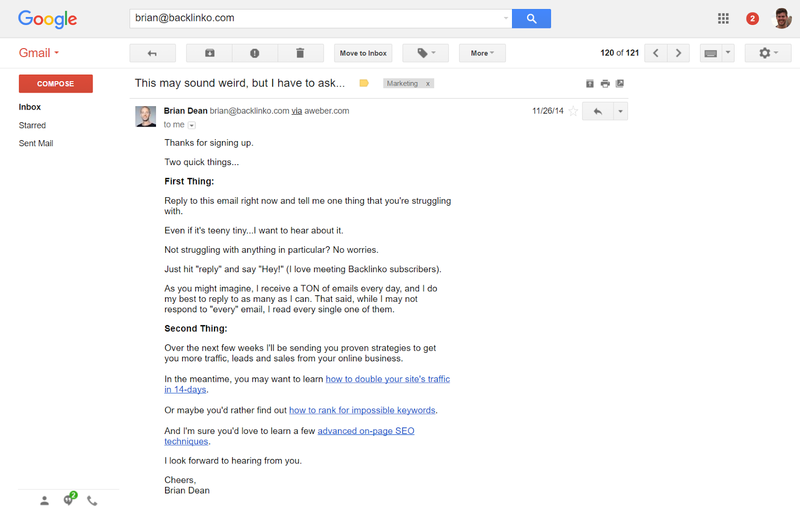 I think I’ve sent Brian 4 or 5 emails over the last few years, and he’s responded to 3 or 4 of them, and that’s a big part of why he’s my “go to” resource for SEO, why I reference his work all the time in my articles, and why I frequently recommend his course. Your confirmations emails can be a major asset in your email marketing funnel. 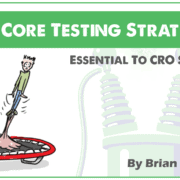 The ideas we’ve discussed today will get you started, but be willing to run some split tests and dig a bit deeper. There are numerous options we weren’t able to list today, any of which might be a goldmine for your business. And of course, if you’ve already found some winners, let us know in the comments! I would like to add to the first point. Instead of just saying thank you, it would be better if you put in a link or two of your top performing posts (completely avoid product pitch). This could possibly help in moving the subscriber to the next level of the funnel a bit quicker. Is it a co-incidence that the person that came to my mind while reading the firsts point was Brian Dean and bingo! you mentioned him in the third point. It is said that the best time to ask someone for a sales is right after they have purchased something from you. Sending them off to read a post ejects them from the purchase process altogether. We should not be afraid to ask someone to make a choice if it could be in their best interest. I agree with the point that if someone has bought a product from you it is better to pitch them another one (like most e-commerce sites do). Mohammad, I think the effect still applies for email subscribers, but the bar may need to be lower. This is a good place for a low-cost purchase.